After the tracing is done take a tape measure or a ruler and measure the tracing from the longest points. Take measurements in exact position shown in the image displayed here. Have the skater stand on the paper with normal weight on both feet, wearing what they normally wear when skating (tights, socks or bare feet). Hold a pencil in upright position and trace close to the foot. ​Determine if your skater has a flat, normal or high arch. ​Complete this section below if your skater is in STAR 5 or higher. 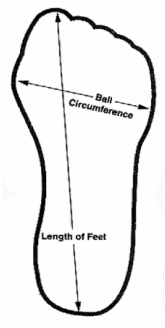 Take measurements using a tape measure to determine the details indicated in the image displayed here. Indicate any additional comments you may have or if you need your skates by a certain date. We will contact you after the order is finalized and at that time we will require the payment. Please note that we accept Visa, MC, AMEX, PayPal, E-Mail Money Transfer, Cheq or Cash. (No orders will be placed until we have at least 50% of the order paid. Complete this section if you would like your skates shipped to you. North Edge ships using Greyhound Courier unless otherwise specified by you. If you do not want us to ship your skates to you please indicate what you would like us to do in the comments section.